Connor had other plans. I don't think I've ever felt a horse flip me the bird quite as distinctively as Connor did last night. Right after I got on he leaned on the bit hard and marched forward, doing his best impression of a kid wearing earmuffs. It was like "I know what you're going to ask me to do, Crazy Lady (he calls me Crazy Lady in my head), and nah nah nah nah naaaaaaah nah!" show ever. MORE INSIDE LEG! - I am not using enough inside leg, so he's falling in quite hard at corners and when we change the bend, which throws everything off. Thinking about using my inside leg at the stirrup bar was key, while also lessening the pressure in the same place on the outside of the saddle. - I'm trying to use my inside rein to push him out in those situations and make up for the lack of inside leg, when all that rein should be doing is asking for the degree of bend. - I feel like I need to use the inside rein in that way because I don't have enough outside rein contact. 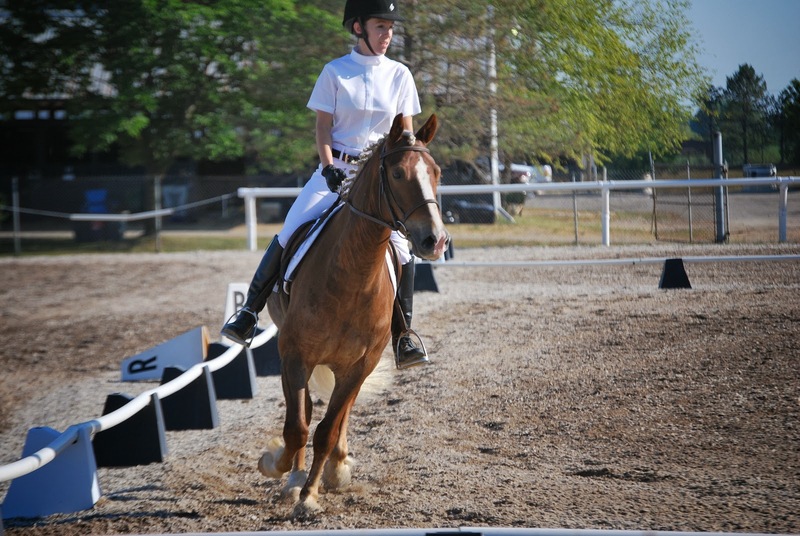 - A lot of our problems start from a lack of hind end impulsion, which is happening because I'm having a hard time with the concept of slowing the front legs down while keeping the hind legs pushing, and then I'm not using enough leg when I touch the reins. More bumps with the inside leg - and occasionally the outside leg too - made a difference here. - My head/torso are always turned to the inside by a big degree and Connor NEVER travels in a straight line (you should see my trainer trying to get him to stop wiggling and go straight...it's ridiculous) but when I think about turning my torso to the outside (which makes it straight) he stops swinging his hindquarters around behind me and actually travels straight. By the end, we were trotting in a nice, relaxed, long frame and he was carrying his own head, which is a far cry from the beginning when his overdeveloped Cob underneck muscle was as tense as he could possibly get it. I'm very glad that attitude showed up in a lesson, because it was definitely one of those situations where I couldn't possibly have taught the lesson that needed to be taught to him by myself, and because we did learn a lot of things about my position from it. I always learn from your lesson re-caps Jen! Thanks for sharing thru your blog. Oh, and your cover photo is lovely! Thanks, Kelly! I'm glad you like it. Hubby took the cover photo, if you can believe it!